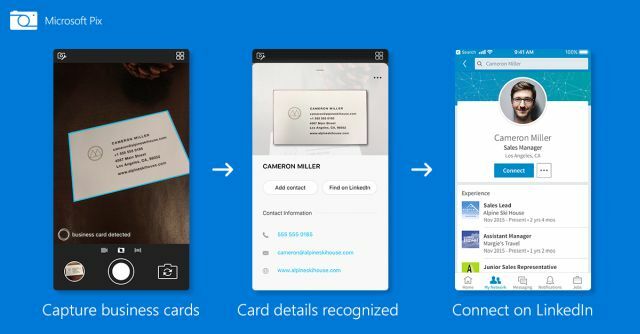 As part of its latest update to Microsoft Pix, the Redmond giant is rolling out a new ‘Business Card’ feature that it says will not only scan business cards, but also integrate the software with professional social networking platform, LinkedIn. The update started rolling out Friday, and is already available for download on the App Store (Version 1.5.2). The new feature builds on Microsoft Pix’s ability to automatically scan documents – an Office Lens-like feature that was added to the software last September. The new feature enables the app to not only scan business cards and copy its entire content as text, but also allows the user to save the information to the address book on their iPhones. What’s really interesting is that users will also be able to sync the app with their LinkedIn accounts to save the scanned details of their professional acquaintances. To be able to do that, all one needs to do is sign in to LinkedIn, launch the app and point the camera at a business card. Pix will take a fraction of a second to get the scanning done, following which, users will be presented with two options – ‘Add Contact’ or ‘Find on LinkedIn’. Depending on the chosen option, Microsoft says Pix will either automatically organize the contact information (name, phone, address, URL etc.) into the correct fields on the iPhone’s Contacts app, or add the details to the user’s list of connections on LinkedIn. “Pix is powered by AI to streamline and enhance the experience of taking a picture with a series of intelligent actions: recognizing the subject of a photo, inferring users’ intent and capturing the best quality picture,” said Josh Weisberg, Principal Program Manager at Microsoft Research. In case you’re unaware, Microsoft has been on a LinkedIn-integration spree of late, having acquired the social platform back in 2016 for a whopping $26.2 billion. The company has already rolled out LinkedIn integration for Office 365, Outlook.com, Dynamics 365, MS Word and Windows 10 over the past couple of years, which is why the latest move from the company is not at all surprising.